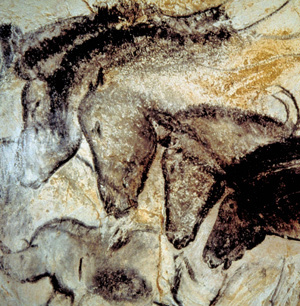 Ancient DNA has shed new light on the realism of horses shown in prehistoric cave paintings dating back 25,000 years. An international team of researchers has found that all the colour variations seen in Paleolithic cave paintings - including distinctive leopard spotting, was present in horse populations before they were domesticated. The DNA findings lend weight to the argument that the artists were reflecting their natural environment and were not painting abstract or symbolic works about their surroundings. The study, published today in the Proceedings of the National Academy of Sciences, is also the first to produce evidence for white spotted phenotypes in pre-domestic horses. Previous ancient DNA studies have produced evidence for only bay and black horses. Archaeologists have long debated whether works of art from the Paleolithic period, particularly cave paintings, are reflections of the natural environment or have deeper abstract or symbolic meanings. This is particularly true of the cave painting "The Dappled Horses of Pech-Merle" in France, which dates back more than 25,000 years and clearly depicts white horses with dark spots. The dappled horses' spotted coat pattern bears a strong resemblance to a pattern known as "leopard" in modern horses. However, as some researchers believed a spotted coat phenotype unlikely at this time, pre-historians have often argued for more complex explanations, suggesting the spotted pattern was in some way symbolic or abstract. Researchers from Britain, Germany, the United States, Spain, Russia and Mexico, genotyped and analysed nine coat-colour gene locations in 31 pre-domestic horses dating back as far as 35,000 years ago from Siberia, Eastern and Western Europe and the Iberian Peninsula. This involved analysing bones and teeth specimens from 15 locations. They found that four Pleistocene and two Copper Age samples from Western and Eastern Europe shared a gene associated with leopard spotting, providing the first evidence that spotted horses existed at this time. In addition, 18 horses had a bay coat colour and seven were black, meaning that all colour phenotypes distinguishable in cave paintings - bay, black and spotted - existed in pre-domestic horse populations. "Our results suggest that, at least for wild horses, Paleolithic cave paintings, including the remarkable depictions of spotted horses, were closely rooted in the real-life appearance of animals," said Professor Michi Hofreiter, from the Department of Biology at the University of York in Britain. "While previous DNA studies have produced evidence for bay and black horses, our study has demonstrated that the leopard complex spotting phenotype was also already present in ancient horses and was accurately depicted by their human contemporaries nearly 25,000 years ago. "Our findings lend support to hypotheses that argue that cave paintings constitute reflections of the natural environment of humans at the time and may contain less of a symbolic or transcendental connotation than often assumed." A modern foundation-bred appaloosa showing the leopard coat pattern. The data and laboratory work were led by Dr Melanie Pruvost, from the Department of Evolutionary Genetics at the Leibniz Institute for Zoo and Wildlife Research and the Department of Natural Sciences at the German Archaeological Institute, both in Berlin. The results were replicated in laboratories at the University of York. Pruvost said: "We are just starting to have the genetic tools to access the appearance of past animals and there are still a lot of question marks and phenotypes for which the genetic process has not yet been described. "However, we can already see that this kind of study will greatly improve our knowledge about the past. "Knowing that leopard spotting horses were present during the Pleistocene in Europe provides new arguments or insights for archaeologists to interpret cave arts." Dr Arne Ludwig, from the Leibniz Institute for Zoo and Wildlife Research in Berlin, added: "Although taken as a whole, images of horses are often quite rudimentary in their execution, some detailed representations, from both Western Europe and the Ural mountains, are realistic enough to at least potentially represent the actual appearance of the animals when alive. "In these cases, attributes of coat colours may also have been depicted with deliberate naturalism, emphasising colours or patterns that characterised contemporary horses." Exact numbers of Upper Paleolithic sites with animal depictions are uncertain because of ongoing debates about the taxonomic identification of some images and dating. However, art of this period has been identified in at least 40 sites in the Dordogne-Périgord region, a similar number in coastal Cantabria and around a dozen sites in both the Ardèche and Ariège regions. Where animal species can be confidently identified, horses are depicted at the majority of these sites. Professor Terry O'Connor from the University of York's Department of Archaeology was involved in the interpretation of the results. "Representations of animals from the Paleolithic period have the potential to provide first-hand insights into the physical environment that humans encountered thousands of years ago," he said. "However, the motivation behind, and therefore the degree of realism in these depictions is hotly debated. "The depictions of horses at Pech-Merle in particular have generated a great deal of debate. The spotted horses are featured in a frieze which includes hand outlines and abstract patterns of spots. "The juxtaposition of elements has raised the question of whether the spotted pattern is in some way symbolic or abstract, especially since many researchers considered a spotted coat phenotype unlikely for Paleolithic horses. "However, our research removes the need for any symbolic explanation of the horses. "People drew what they saw, and that gives us greater confidence in understanding Paleolithic depictions of other species as naturalistic illustrations." Leopard complex spotting in modern horses is characterised by white spotting patterns that range from horses having a few white spots on the rump to horses that are almost completely white. The white area of these horses can also have pigmented oval spots known as "leopard spots". Dr Monika Reissmann, from Humboldt University's Department for Crop and Animal Sciences, explained: "This phenotype was in great demand during the Baroque Age. "But in the following centuries the leopard complex phenotype went out of fashion and became very rare. "Today, leopard complex is a popular phenotype in several horse breeds including Knabstrupper, Appaloosa and Noriker and breeding efforts have intensified again because there is a growing interest in the restoration of these horses." The fact that four out of 10 of the Western European horses from the Pleistocene had a genotype indicative of the leopard complex phenotype suggests that this phenotype was not rare in Western Europe during this period. However, bay seems to have been the most common colour phenotype in pre-domestic times with 18 out of the 31 samples having bay genotypes. This is also the most commonly painted phenotype in the Paeolithic period. 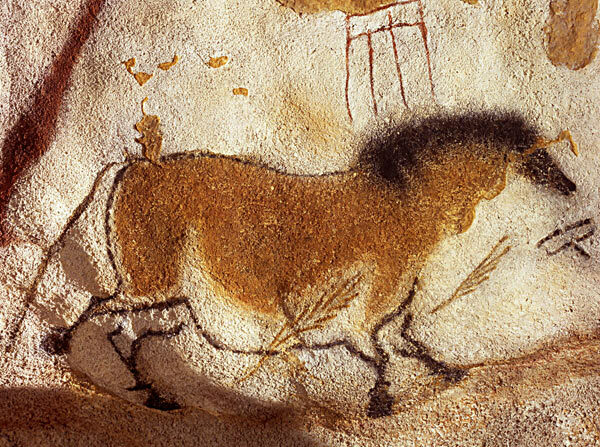 A horse from the "Panel of the Chinese Horses" from the Lascaux Cave. © N. Aujoulat, Ministère de la Culture et de la Communication, France. "Genotypes of pre-domestic horses match phenotypes painted in Paleolithic works of cave art", is published in Proceedings of the National Academy of Sciences (PNAS). The study authors were: Professor Michi Hofreiter, Department of Biology and Professor Terry O'Connor, Department of Archaeology, both University of York, UK; Arne Ludwig, Department of Evolutionary Genetics, Leibniz Institute for Zoo and Wildlife Research, Berlin, Germany; Melanie Pruvost, Department of Evolutionary Genetics, Leibniz Institute for Zoo and Wildlife Research, Berlin, Germany and the Department of Natural Sciences, German Archaeological Institute, also Berlin; Rebecca Bellone, Department of Biology, University of Tampa, Tampa, USA; Norbert Benecke, Department of Natural Sciences, German Archaeological Institute, Berlin, Germany; Edson Sandoval-Castellanos, Laboratorio de Genètica Ecológica y Evolución, Departamento de Ecología Evolutiva, Instituto de Ecología, Universidad Nacional Autonoma de Mexico, Mexico City, Mexico; Michael Cieslak, Department of Evolutionary Genetics, Leibniz Institute for Zoo and Wildlife Research, Berlin, Germany; Tatyana Kuznetsova, Department of Palaeontology, Faculty of Geology, Moscow State University, Moscow, Russia; Arturo Morales-Muñiz, Laboratory of Archaeozoology, Universidad Autonoma Madrid, Madrid, Spain; Monika Reissmann, Department for Crop and Animal Sciences, Humboldt University Berlin, Germany.